In the end, we will protect only what we love. Our growing "Kids in Nature" program is designed to get children into nature and light a spark that will last a lifetime. 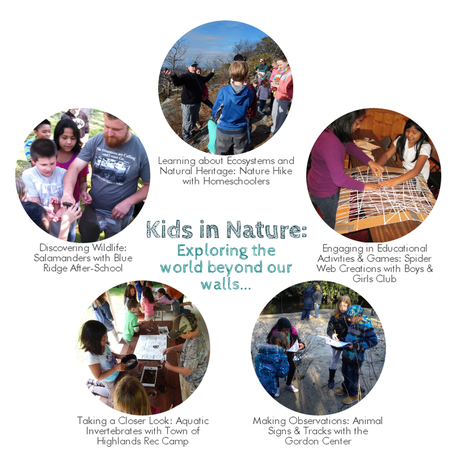 The mountains of Western NC are an ecologists playground and we want to ensure that every child who lives or visits our corner of the world has the opportunity to dig a little deeper and gain an appreciation for our abundant natural heritage. These programs would not be possible without the support of our sponsors: Cashiers Community Fund, Church of the Good Shepherd, Cullasaja Women's Outreach, Highlands Community Fund, Laurel Garden Club, Mountain Findings, Wade Hampton Foundation Fund. Thank you!